The Sheraton Austin Hotel offers upscale lodging in a fantastic downtown location within walking distance of the Texas State Capitol, the Austin Museum of Art, and the Frank Erwin Center at the University of Texas. The Sheraton Austin Hotel is known for its large event space, comfy beds, friendly staff, and Southwestern cuisine. 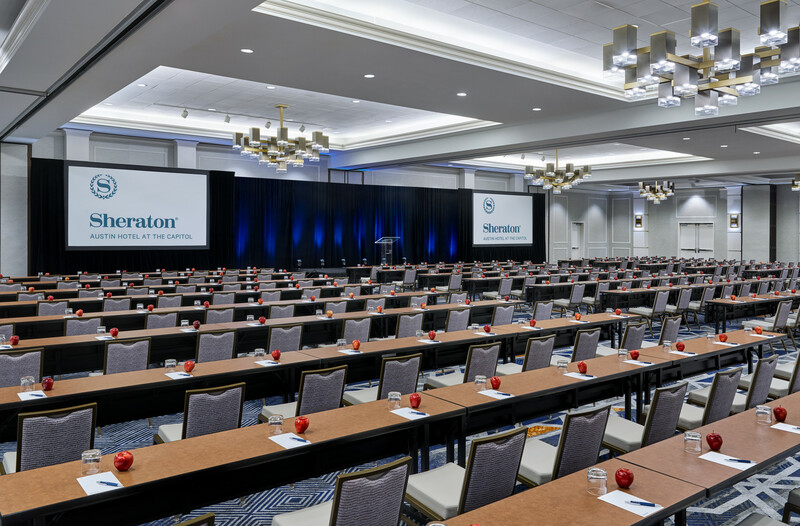 Reservations must be made by directly with the Sheraton Austin Hotel by either calling (888) 627-8349, and referring to the “Texas Radiological Society conference block” or online at The Sheraton Hotel Reservation Link. *Rates do not include applicable state and local taxes, currently 15%. The hotel will stop taking reservations at the TRS discounted room rate after 5PM on Wednesday, March 6, 2019, or when the TRS room block sells out, whichever occurs first. After the cut-off date, it is at Hotel’s discretion whether to accept additional reservations, which will be subject to prevailing rates and availability. · All reservations must be guaranteed by a valid major credit card, to be supplied at the time of reservation. · Reservations must be cancelled by 6 pm 2 days prior to your arrival date to avoid a cancellation fee of one night’s room and tax. · Early Departure Fee: An early departure fee of a one night’s stay will apply if a Customer attendee checks out prior to the confirmed checkout date. Looking to explore Austin? Take in the theatre at Esther’s Follies, enjoy a cruise along the river provided by Capital Cruises or take a walk around the beautiful Texas State Capital building. Don’t forget the shopping on 2nd Street or the many fabulous restaurant options!